Installing and configuring the Zendesk for Salesforce app in Zendesk Support enables agents to see Salesforce user information in a Support ticket. User information might include subscription level, whether a particular account has an open opportunity, or additional customer notes. Note: You must install the Zendesk for Salesforce app before you configure the app in Zendesk Support. To read about other Zendesk for Salesforce features, see Choosing Zendesk for Salesforce features. For links to all of our Salesforce documentation, see Salesforce integration resources. If you are using the current version of Zendesk Support, you need to get the Salesforce app and install it in your Zendesk. In Zendesk Support, click the Admin icon ( ) in the sidebar, then select Apps > Marketplace. In the search box, enter Salesforce to locate the Salesforce app. Click the Salesforce app, then click Install. Use the drop-down menu to select the account where you want to install Salesforce, then click Install. The Salesforce app is installed, but not enabled, on your Zendesk Support account. On the Salesforce app page, use the toggle to enable the Salesforce app. 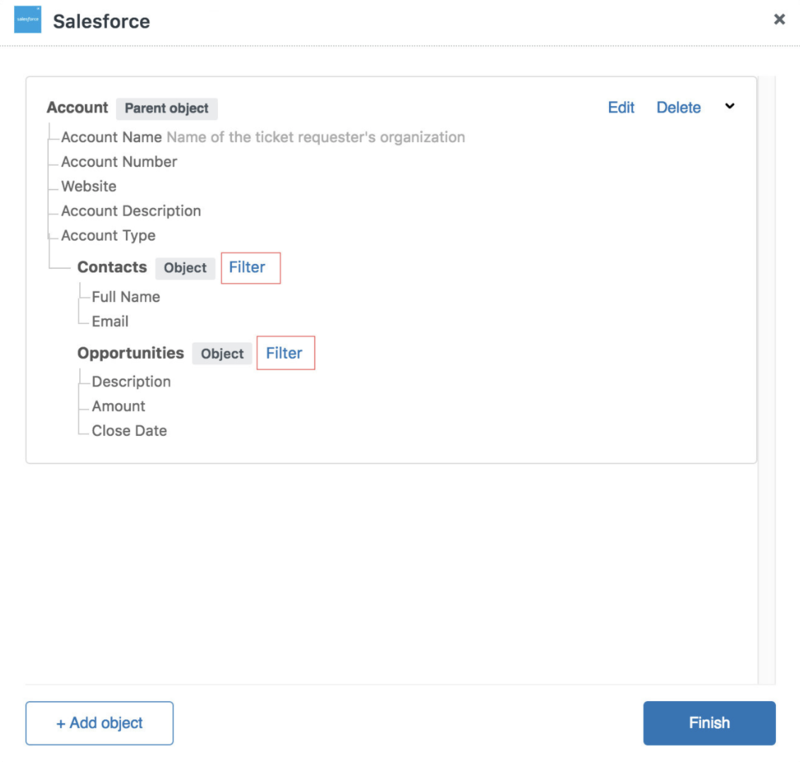 You must have administrator credentials in Salesforce to connect Zendesk to Salesforce. In Zendesk, click the Admin icon ( ) in the sidebar, then select Settings > Extensions. Use the Select CRM drop-down to choose Salesforce. Steps to connect to Salesforce appear below the drop-down menu. 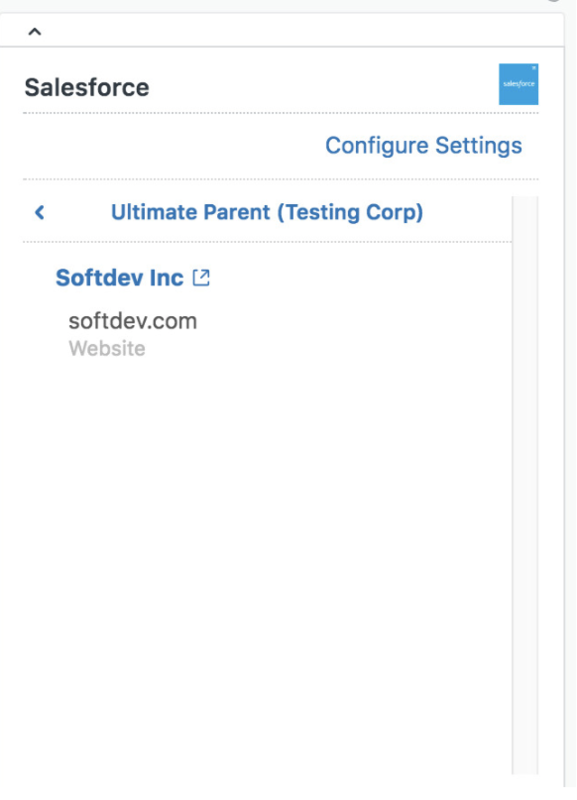 In the first step, Connect to Salesforce, click the Connect to Salesforce link for either Production or Sandbox. When you are redirected to Salesforce, enter your Salesforce administrator username and password. This authorizes Zendesk to access your Salesforce account. Ensure that the Salesforce credentials you enter are for a Salesforce administrator so that you have the right permissions to retrieve user data. When prompted, click Allow for Zendesk to retrieve information from Salesforce. When the authorization is complete, you return to the CRM tab in Support. Leave the page open for the next procedure. 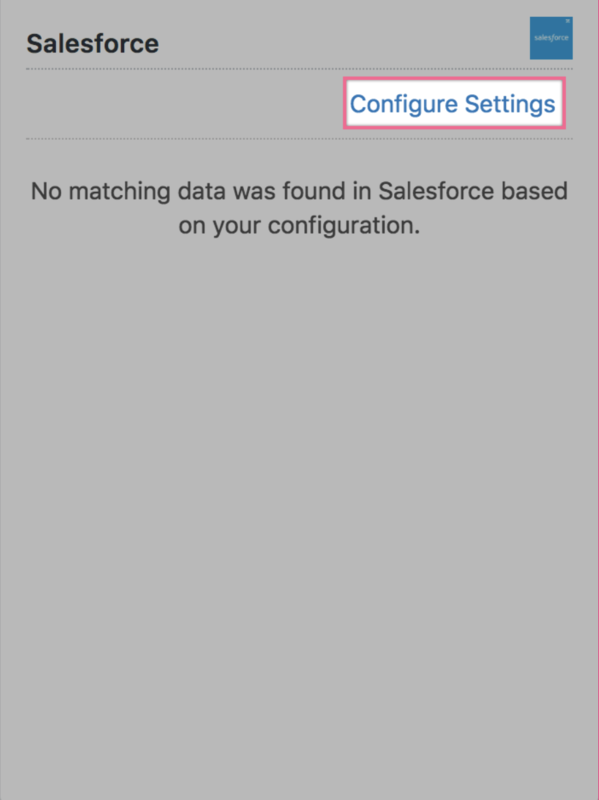 You can customize the data displayed in the Salesforce app, and how often the data is refreshed, by configuring the app settings discussed in this section. These are applied when viewing Salesforce information from a ticket, and are configured as part of a single process. 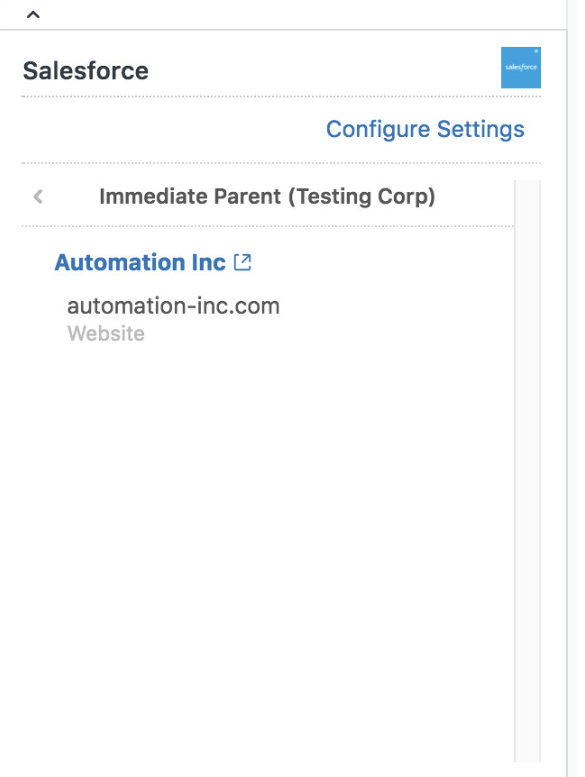 A Zendesk administrator can configure these settings from the configuration link in the app, by opening up a ticket in Zendesk Support, finding the Salesforce app in the sidebar, and clicking the Configuration link. Note: To configure the settings described in this section, the ticket you open in Support must have a requester attached to it. Tickets without a set requester cannot access the Salesforce app. This process allows you to define which Salesforce objects appear in the app in Zendesk Support. Only users with Zendesk administrator privileges, or users in custom roles with Manage extensions and channels privileges, are able to configure the app. Configuration can be accessed by clicking the Configure Settings link in the app. Open an existing ticket in the Zendesk Support ticket view. In the Apps sidebar, locate the Salesforce app. Click Configuration Settings, then click the Add object button. The Select Salesforce fields to display section displays all fields available on the Salesforce object you selected. In the Salesforce fields window, click Add (+) beside each field that you want to display in the Salesforce app for that object. One of the fields you select must contain data that matches a field in Zendesk. Scroll down the list of Salesforce fields and expand one of the related objects to see its fields, then add fields from the expanded object. You can drag and drop fields within each object you have selected to change their order. The order represented in the configuration will determine order of fields displayed in the Salesforce app. In the Map fields to enable record lookup section, use the Selected Salesforce Fields drop-down to select a Salesforce field, then use the Zendesk field drop-down to map fields to enable record lookup. For any given Zendesk ticket, Zendesk attempts to find a record in Salesforce whose data in the selected Object and field exactly matches the data contained in the specified Zendesk field. Example: Retrieve any account where the Salesforce Account Name exactly matches the Zendesk requester organization on this ticket. To enable displaying of account hierarchy, continue on to the steps in Enabling the account hierarchy; otherwise, click Save. If you’ve added a related object that can have a one-to-many relationship, and you want to filter the returned objects, continue on to the steps in Filtering the returned objects. Click Add object again if you want to add another object to your Salesforce app. Click the Finish button to close the configuration window. When the window is closed, CRM data on the current ticket will be retrieved using the new configuration. It might take a while (depending on number of active CRM data) for the rest of ticket’s CRM data to be retrieved using the new configuration. In Salesforce, an Account record can look up to another account via the Parent Account field. This parent account can, in turn, have its own parent account. As a result, accounts can have a chain of parent accounts related to it. The account hierarchy setting allows you to choose to display an account record’s immediate parent account and the ultimate parent account (the root account in the hierarchy). By default, the option to display the hierarchy is disabled. To display the account hierarchy in the Salesforce app, you must have the Account object added to your app customization. 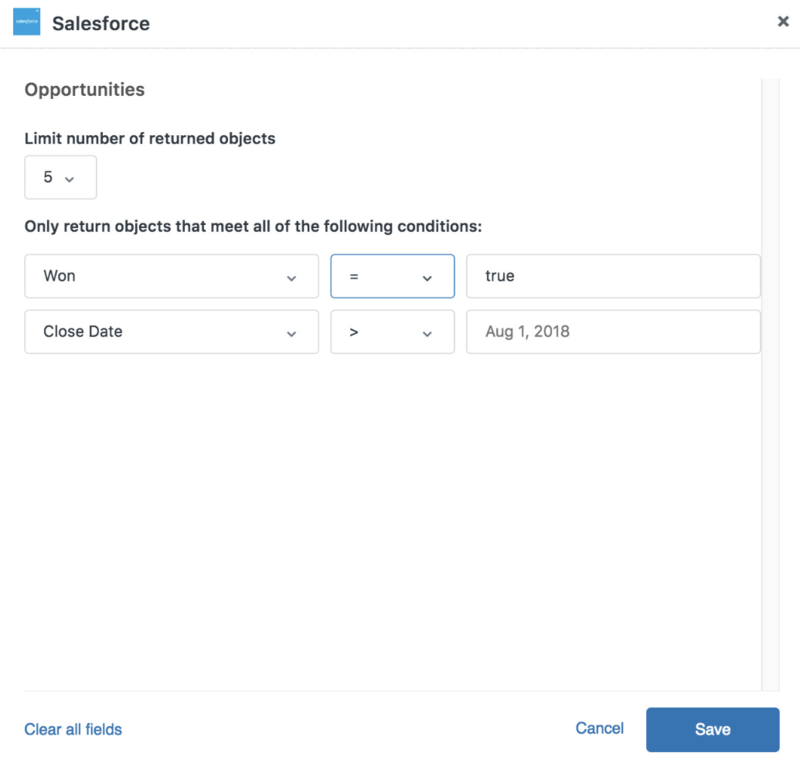 See Adding Salesforce Objects to your app for information. None disables the hierarchy display. Show immediate parent enables the display, and shows the record’s immediate parent account. Show immediate and ultimate parent enables the display, and shows both the record’s immediate parent account, and its originating (or root) parent account. When enabled, the app displays the account related to the ticket, its immediate parent, its ultimate parent, and the selected fields during customization. You can filter the returned objects in the app. In the object list, click Filter next to the object you want to work with. In the Filter Records dialog, select the number of returned objects (up to five), and set conditions to filter the results. For example, if you're filtering Opportunities, you could set Closed is false, then only open Opportunities would display. Or you could show Opportunities that have been closed and were won by setting Won is true. 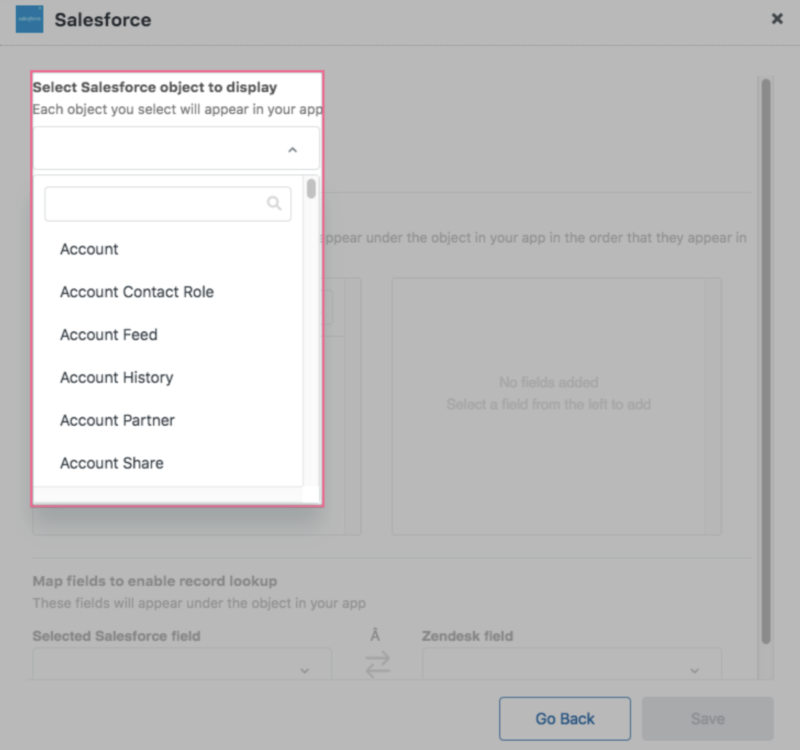 When you open a Zendesk Support ticket, the app fetches and displays Salesforce data you selected in the procedure described in Adding Salesforce objects to the app, above. By default, data is refreshed every 60 minutes. You can request permission to access the data refresh setting. Permission is granted on a per-account basis. After gaining access to the data refresh setting, you can define how long Salesforce data is cached in the Zendesk database -- 60 minutes, 45 minutes, 30 minutes, or 15 minutes. A shorter refresh rate means data is collected from Salesforce more often, and is more likely to be up to date; however, this can impact the Salesforce API limits. A longer refresh rate means data is collected less often, but will lessen the risk of running into the Salesforce API limits. Request access to the data refresh setting by emailing support@zendesk.com. When access has been granted, go to Zendesk Support and open the CRM tab. Use the App configuration drop-down to select Customize new settings. Use the next drop-down menu to select how long you want to cache the Salesforce data. After you have installed the Zendesk for Salesforce app you can easily view Salesforce information from a ticket in Zendesk. Note: It can take up to sixty minutes for recently viewed tickets to appear updated in the Salesforce app after you make a change to the ticket or to the app configuration. For information on changing this rate, see Configuring the data refresh setting, above. With a ticket open in Zendesk, click the Apps button on the upper-right side of the ticket page. The Salesforce app displays in the right sidebar. I've reinstalled Zendesk app on both Salesforce and Zendesk, Currently I'm having the below issue when trying to setup Salesforce target in Zendesk, I'm sure I have put the correct password, since I'm able to login to Salesforce. "1801: Missing, invalid or expired OAuth Token Parameter"
There are a lot of different variables that could be attributed to that error based on how your integration is set up. I will reach out to you over a ticket so that we can take a closer look at what your particular workflow is and how we can fix that issue. The "Account Owner" field is unfortunately not supported. The reason is that this field is what is called a lookup field in Salesforce, and it simply do not translate to any Zendesk field appropriately. With that said, you could do this with custom fields if you'd really like this info in Zendesk. You can create a custom field (I'd recommend a text field) in Salesforce by going to Setup > Customize > Accounts > Fields. You can then create a custom organization field in Zendesk. Afterwards you should be able to map them as you would normally. The thing to keep in mind is that certain field types in Salesforce can be mapped to certain field types in Zendesk, these relationships are detailed here. I have come back to look at the Salesforce app after a while of saying that it is not for me. Things change and often for the better. However in my case there still appears to be no change in the limited number of fields within Zendesk that you can map from. All i wish to do is to display Salesforce data within Zendesk and I will do my lookup from the Zendesk organization to the Salesforce Account. Unfortunately my options are limited to Name of the Organization. This is unreliable unless you are in a position where you can fully sync in both directions the names of accounts and organizations. You may well be able to but I do not want that full sync. Will there ever be an update to the app that will allow you to map from other organization fields, especially custom fields? Or is it possible to get the code for the app to modify ourselves? Mostly good news for you. We're actually building up a team that will, among other things, be responsible for improving the Salesforce app. In the short-term that means you're not likely to see any changes, but you will start to see much more movement once that team is up and running. After completing the setup we cannot see the Salesforce app in the User's profile page. Trying to pull CSM value from SF; however, I only get the ID of the CSM, not the name of the CSM. How can I get the Name of the CSM rather than the ID? It sounds like your CSM field in SFDC is likely a Lookup field. On the backend these fields just hold the ID of the record they reference. They are really nice when working inside Salesforce as the application knows to translate that ID into the name of the record. However when you send the value of a lookup field elsewhere, you're just going receive the ID, the actual value stored in the field. In order to accomplish your goal here, you'd need to create a Formula field in Salesforce. You can configure the formula field to get the name of the CSM and output it as plain text. You can then easily add this field to display in the sidebar app, which will return the CSM's name properly. I hope this helps! If you have further questions, we'd love to help get them answered, just open a ticket! Hey Diziana! I see you're getting help with this in a ticket, so we'll get you taken care of there. Definitely feel free to share the solution when you find it! This can be disregarded. It looks like it just takes about an hour which it alludes to above under 'Viewing Salesforce information from a Zendesk ticket' though I though that was referring to something else.. I've installed Zendesk app on both Salesforce and Zendesk but cannot get the tickets to be sent to Salesforce. Please advise as I have been trying to set it up for days now. I keep getting the below message when setting up the target. Hi Sophia! I'm looking for someone to help you with this. Stand by! Just to make sure, does your Salesforce plan have API access? To use the Zendesk-Salesforce integration it requires access to the Salesforce API. According to the following resource Salesforce does not give API access to Professional, Group or Contact edition: https://help.salesforce.com/articleView?id=000005140&type=1. Just want to rule that possibility out! Is there a way to resize the app sidebar for the Saleforce app? I want to fill the sidebar. Also, on the new features webinar, I saw that the Salesforce 2.0 app was available but I cannot find how to update from the 1.1.1 version I have. At this time there is no way to resize the app in the side bar. Regarding your second question it sounds like there may have been a mixup about a couple things. There were some recent updates to the app, but no major changes to the code so there's no change in version numbers. Our team is working on a version 2.0 of the app but it's still very much a work in progress and not available for download yet. You can find a bit more information about the new features and functionality that were mentioned in the webinar here: Zendesk for Salesforce Updates. I'd like to match the Selected Salesforce Field to a custom Zendesk Organization field we've created, but that doesn't seem to be possible. Is there a way to do this that I'm missing, or do you have to match with a Ticket field specifically? Thank you! Hi there. I'm trying to configure the settings on the SFDC integration, but I am only able to look up the contact object by one field mapping. That presents a problem as I get inbound calls and inbound emails as they present into Zendesk. If an inbound call comes in, I won't be able to associate that to the correct contact/account in salesforce if I only use the email to match to contacts. I'd imagine that this has been a problem that's been solved before. How do you suggest I get past this hurdle? Again, I want to look the contact up by the phone and email. Organization and User fields can be mapped to Contact/Lead or Account fields in Salesforce, but only with matching types as show here. Currently each object can only have one mapping. Connecting incoming calls to a profile with an Email in Zendesk would help reduce this from happening. A typical call workflow in Zendesk includes adding an email to the ticket. Alternatively you could use Leads for phone matching and Contacts for email matching, but that depends heavily on how you are using these types in Salesforce. I am trying to use the formula field to push the CSM (SF User Lookup) over to Zendesk. Everything works if I want to add it to the side bar but it doesn't seem to be able to push it as a tag. Is this by design? or is there a tweak I can make to get it to push over as a tag and not just a mapped field? Reason for this ask is because I want to create views for folks and can only do that off tags unless I am missing something there? Other then adding ever single organization a CSM owns to create a view which I don't want to do. That's a very good question! To my knowledge, this would be expected functionality of the integration. We do have an article over here that might be beneficial to read ( https://support.zendesk.com/hc/en-us/articles/115006550828-Salesforce-Syncing-lookup-field-information-to-Zendesk-Support ) as it covers aspects on how syncing the lookup field works. Some customers have also setup a separate text field that gets populated with a value based on the value of the formula field.This requires creating a custom apex trigger on the Salesforce side of things which is not something we can help with as it would be out of our scope of support. It's also important to note that any Salesforce field you add to the box on the right will have it's value/s set as the tag/s on the org or user. It will not just add them. This means that any existing tags will be removed and replaced with only the values of the fields in the right field box. 1) If I have more than 5 related records, how does it decide which 5 to display? Can I set sorting somewhere so it would be say, 5 most recent records? 2) Is it possible to use relative dates in the filters? If above doesn't work, then I would want to filter based, for instance, on record date is less than 60 days. we installed the app on both SF and ZD sides, but haven't checked the "enable" toggle on the ZD side yet. when I'll do that, will it automatically pull bulk of account/org/user data from SF? or will I be able to control it manually? I don't want automatic users to be created. It won't automatically pull everything when enabled, but you do want to make sure you do things in the right order. Check that out and let us know if you have additional questions. Neither of the above options are having any affect on which assets are being presented. Is there a better way to define the filter to achieve the desired result? Is there a way to bypass the 5 object limit?